HAVANA, May 24 2012 (IPS) - In Los Palacios, a farming community in the western Cuban province of Pinar del Río, local residents are still working hard to rebuild after the damage caused by two of the three hurricanes that hit this country in 2008. “It was just horrible,” people here say when asked about what happened. Within the space of just 10 days, Hurricanes Gustav and Ike destroyed thousands of homes and wiped out all of the crops in their path. “Almost nothing was left standing,” Anarey Lazo, a local woman who is working as a quality control technician in the town’s construction materials factory, told IPS. Because there was such a heavy need for materials for rebuilding, local residents joined the factory workers, to bolster production. 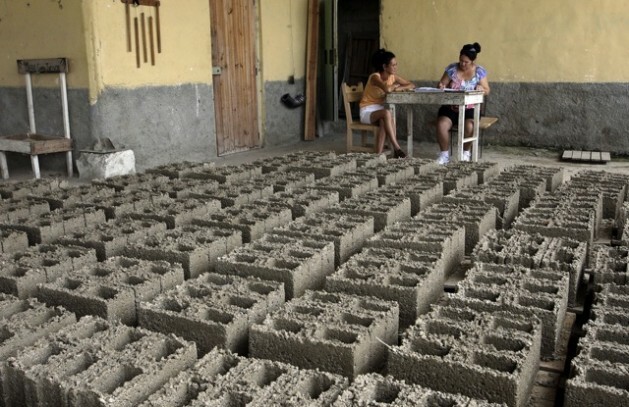 “For now, between 900 and 1,000 blocks a day are made, to build walls” said Yasniel Rodríguez, the foreman in the factory, which produces all of the construction materials necessary to rebuild. “But we should be able to increase that number to 3,000, with a new machine that we just got. We have the roof tile moulds now too,” he added. Because many of the local homes were already in poor condition, the impact of the storms was even greater. Gustav, with sustained wind speeds of 240 km per hour, hit the area in the afternoon of Aug. 30. A wind gauge recorded a maximum speed of 340 km before breaking. The CGRRs, financed with help from international donors, are scattered throughout Cuba. Argos said these offices are essential tools in decision-making among local authorities, and are equipped to gather information and assess the situation in each region and among the local population in the face of emergencies caused by tropical storms, flooding or other disasters. The Los Palacios CGRR, located in the southwest corner of Pinar del Río, a province that is frequently hit by tropical storms, has six early warning posts fitted out with megaphones, flashlights, generators and other equipment to warn the population and keep communication lines open. Despite the magnitude of the impact, there was no loss of human life, although the hurricanes left lessons. “People became more aware of the importance of the risk-prevention measures that are taken,” the first secretary of the Communist Party in Los Palacios, Lázara Barrios, told IPS. She added that climate change is making it necessary to ramp up prevention measures – a view that is shared by other authorities in Cuba. “We also have to be prepared to deal with unexpected phenomena like the severe local storms that have hit us lately in Pinar del Río,” she said. Although there is no agreement among experts as to whether there has been an increase in the number of tropical storms, climate change researchers predict that they will become more frequent and more intense. “Just imagine! Our province is like the ‘freeway’ for hurricanes passing through Cuba,” Argos said. Faced with the need to adapt to the new conditions, the system of evacuation of local residents in high-risk areas during emergencies has shifted to less costly methods. The mass evacuation of the population to shelters has begun to give way to the prior identification of safe houses that can take in vulnerable families from the same block or neighbourhood. “Everyone here is convinced that the cyclones will become more intense, and people are prepared for that,” said Ismaray Hernández, a nurse who took in several families from the same block during the storms, because her house is more solidly built. “People know they have to secure their roofs, even if it’s just with sandbags, and protect their windows,” she told IPS. The main vulnerability in Los Palacios, a town of 40,000, is the rickety condition of many local homes: some 10,000 houses suffered some level of damage in 2008, and around 4,000 have yet to be repaired. In the nearby village of San Diego de los Baños, 17 homes have been built using palm trees knocked down by the hurricanes. “I lived on a hill, where I have a ‘veguita’ (small tobacco plantation), but my house was in really bad condition and the storm carried it away,” said Eloína Martínez, a 75-year-old widow. Martínez said she actually benefited, though, because now she has a nice new home, with electricity, while she still has her plot of land, which her son farms. When the next storm hits, she will be able to take refuge in her bathroom, which was built with a concrete ceiling to serve as a solid shelter – a system used in all of the new homes constructed with fallen palm trees. Other families in San Diego de los Baños decided to revive the old rural tradition of “vara en tierra”, which are low, dirt-floored huts. 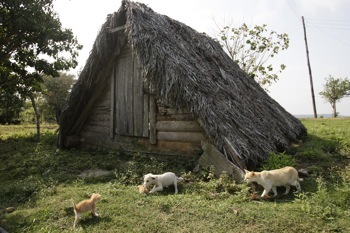 These peculiar small palm-thatched structures, which are used to store the harvest, are also ideal as shelters during hurricanes. “I don’t know the secret, but this one made it through the storm, and protected 12 people. We even put the refrigerator inside,” said another local resident of San Diego de los Baños. The national disaster prevention system has made Cuba the country with the lowest number of storm-related fatalities in the area encompassing the Atlantic Ocean, the Caribbean Sea and the Gulf of Mexico. Experts say it even outperforms highly developed countries, thanks to its integrated disaster prevention system. Every year, a few weeks before the start of the Jun. 1-Nov. 30 hurricane season, the authorities begin to organise community evacuation and preparedness drills.